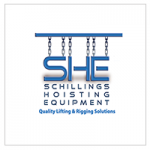 Shillings Hoisting Equipment (SHE) is a sister company of our initial Australian customer HES VIC. As you might expect with a successful company, they needed to spread their wings and they did all the way to Adelaide (South Australia). To put that in context, Adelaide is as far from Melbourne as London is from Frankfurt. It is no mean feat that SHE operates with the same marketing prowess as HES VIC given the distances involved. After initial trial period of Sitecert with HES VIC, it wasn’t long before the same efficiency with inspection was demanded in SHE. SHE quickly rolled out the system flawlessly within their existing customers and use it as a tool for opening doors and cementing relationships. SHE are also a member of the Global Lifting Group giving access to major brands and discounts with bulk buying. This is a great way for like- minded companies to operate and cut out the middle men. It is ideal in a country like Australia given the distance between cities and very little cross over between members area’s / customers. This cross over may become more blurred with online selling becoming popular as anybody selling online will testify. They often get customers in the most unusual places – just from having a good online presence. You may wonder how an Irish company can have customers as far away in Australia, but that the value of the Internet and a having top class, stable product. We have got other Australian customers from word of mouth within the industry. Sitecert is delighted to be working with customers at the other side of the world and this ensures quality is maintained with new releases. Shillings are also members of LEEA, which is no surprise as CEO Dean Nelson was the first LEEA Chairman in Australia.